PRESIDENT BARTLET: Shenandoah National Park, right here in Virginia! We should organize a staff field trip to Shenandoah. I could even act as the guide. What do you think? JOSH: Good a place as any to dump your body. PRESIDENT BARTLET: What was that? Way back before I was a long-distance hiker and amateur park historian, I was a college junior who skipped class in order to marathon The West Wing on my roommate’s Netflix account. It was in the middle of this Sorkinism frenzy that I discovered what is now my favorite fact about President Josiah Bartlet: he’s a national park buff. In that same episode, through the quoted dialogue above, I learned about Shenandoah National Park. As I watched the show in my Los Angeles college apartment, I would not have guessed that two years later I would hike through that same park on the Appalachian Trail. The blackberry milkshakes at the waysides were literally heaven in your mouth. The views on Skyline Drive were far more enjoyable than the views on the AT. We called hiking on the road “Original White Blazing”. SNP may be rich in black bears, but apparently they were all avoiding me, because I didn’t see a single one. It turns out, Shenandoah National Park is also rich in history. So let’s dive in, shall we? And for what it’s worth, I would have been a most enthusiastic member of your guided hike, Mr. President. When European colonists arrived on the scene, they found the Blue Ridge Mountains largely devoid of any permanent Native American settlements. The Iroquois warriors did travel through the region, and they often clashed with colonists moving into the area. The Treaty of Albany (1722) moved the boundary of the Iroquois people to the west of the Blue Ridge Mountains, making way for incoming settlers. Tensions were still high, and following another violent clash between Iroquois and colonists in 1742, new terms were reached in the Treaty of Lancaster (1744). The Iroquois were offered 200 pounds of gold for their claim on Shenandoah Valley. They accepted this payment, and the land was opened up to settlers. The Europeans who settled into the Shenandoah Valley were a diverse group of Germans, Swiss, Scots-Irish and Dutch. While the primary vocation was farming, jobs in blacksmithing, wagon making and repair work also flourished in the Valley. Mountain residents to be relocated from within the park. NPS Archives. During the 1920s, the National Park Service was on a campaign to create parks near the population hubs on the east coast. Great Smoky Mountains National Park was one such place; Shenandoah National Park quickly followed. Congress authorized the creation of the park in 1926, with the stipulation that the state of Virginia raise all the capital for purchasing the land. The federal government was to have no hand in providing funds for purchase. Many of the farming communities in the Valley took hard hits from the Great Depression, and some tenants were willing to sell their land to the government. Residents who vehemently opposed parting with their homes were evicted on grounds of eminent domain. Throughout the 1930s, Shenandoah National Park was pieced together from over 3,000 plots of land. At least 500 families were displaced in the process. In order to return the land to its “natural state”, the Civilian Conservation Corps dismantled all private housing and infrastructure, save for a few buildings that were spared for historical conservation. Shenandoah National Park was officially established in December 1935. Construction of Old Rag View Overlook by CCC on Skyline Drive. NPS Archives. William C. Gregg, a member of the Southern Appalachian National Park Committee, suggested creating a road that would run the length of Shenandoah National Park. L. Ferdinand Zerkel, a member of the Board of Shenandoah Valley, Inc., liked the idea, and recommended it to the Southern Appalachian National Park Committee to the Blue Ridge Mountains of Virginia. The Committee approved of the project, and following a field survey in January 1931, construction workers broke ground for Skyline Drive on July 18th of the same year. Work on Skyline Drive was outsourced to a multitude of contractors from Virginia, West Virginia, Kentucky, Missouri, and Washington, DC. The road was constructed in ten sections, and in total cost more than $4.5 million to build. 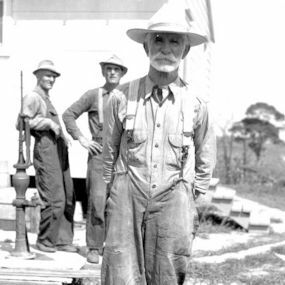 Some of the funds were allocated from the Federal Drought Relief Administration, in order employ Virginia farmers and apple pickers suffering from the severe drought in 1930. In 1932, the federal government appropriated another $1 million for the construction of Skyline Drive. 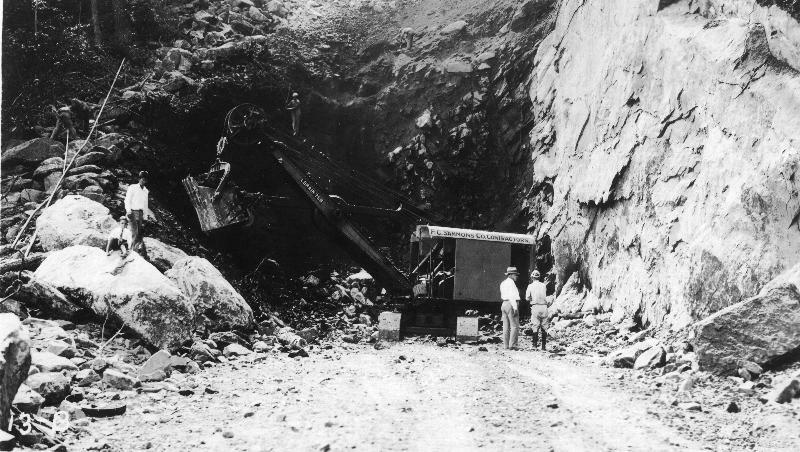 Construction of Marys Rock Tunnel. NPS Archives. One of the greatest engineering achievements on Skyline Drive was the creation of Marys Rock Tunnel. The tunnel, which is 670 feet long, was bored through the solid granite of Marys Rock in 1932. The Civilian Conservation Corp assisted in the work on Skyline Drive by grading slopes on either side of the roadway, building guardrails and guard walls, constructing overlooks, installing signs, and planting trees on both sides of the roadbed. They also built the picnic areas and camp grounds, comfort stations, and visitor and maintenance buildings. 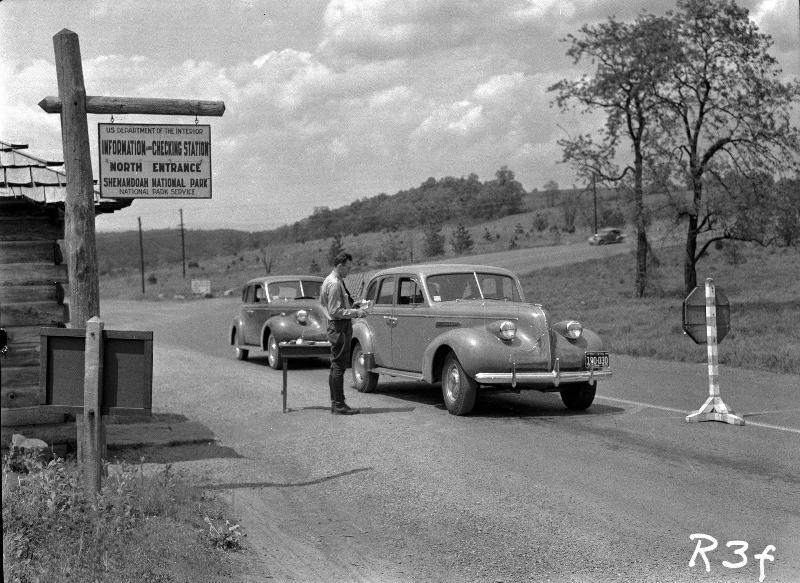 Skyline Drive officially opened on October 23, 1932. The first car to pay the North entrance fee on Skyline Drive. NPS Archives. Shenandoah National Park was created when segregation was still legal in the United States. In order to comply with the requirement that public facilities be “separate but equal”, Shenandoah’s first Superintendent, J. Ralph Lassiter, began construction in 1937 on a “proposed colored picnic grounds at Lewis Mountain”. The Lewis Mountain entrance sign. NPS Archives. The proposed facility was met with resistance from Virginia Sky-Line Company, an organization that ran the park’s development from 1937 to 1942. Virginia Sky-Line wrote to Lassiter, stating that the Lewis Mountain operation would probably operate at a loss, and that the other (i.e., white) facilities would have to “bear an unreasonable burden.” Nevertheless, the Secretary of the Interior was insistent, and construction on the facility continued despite the company’s objections. Portions of the Lewis Mountain facilities were opened in the summer of 1939. The first cabins and lodge were in service in the summer of 1940. While some African Americans welcomed the segregated facilities – for the alternative was to be denied entrance into the park outright – the NAACP and many private citizens protested segregation on federally administered lands. Lewis Mountain didn’t last long, though. 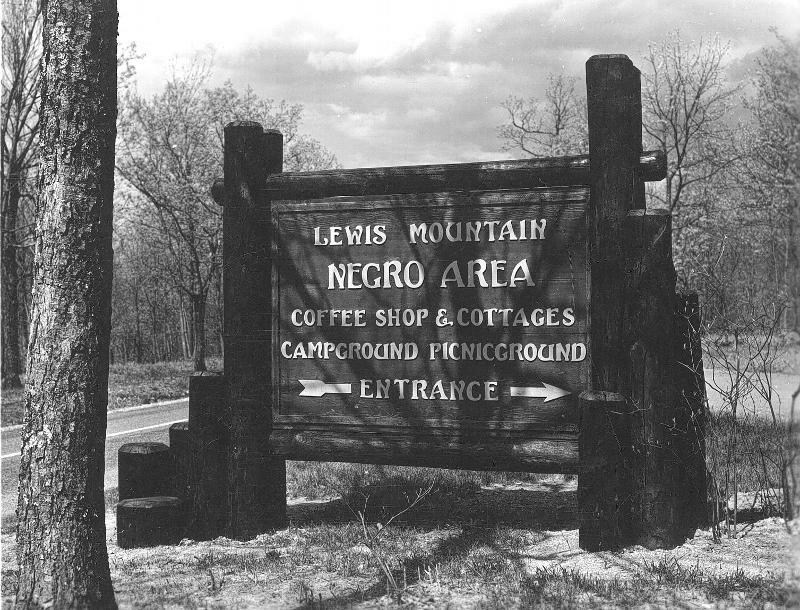 In an effort to raise African American morale during WWII, the U.S. government desegregated all facilities in national parks. The CCC works on constructing the Appalachian Trail in Shenandoah National Park. NPS Archives. The Potomac Appalachian Trail Club was founded in 1927, and by 1931 a section of the AT ran through privately-owned land in the Blue Ridge Mountains. The PATC came out in support for the establishment of Shenandoah National Park, as it would mean the preservation of wilderness along the Appalachian Trail. The PATC and the Appalachian Trail Conservancy came to blows in 1931 over the proposed construction of Skyline Drive, for the road was to be built along the path of the existing Appalachian Trail. PATC President Myron Avery was willing to compromise on the situation, believing that hikers and park visitors could coexist. Benton MacKaye, however, was completely against giving up the Appalachian Trail for a road. This rift ruined the friendship between MacKaye and Avery, and caused MacKaye to leave the ATC to found the Wilderness Society. The Appalachian Trail was relocated lower down the mountain slope. Between 1933 and 1942, the Civilian Conservation Corps built the new trail, shelters, and fireplaces. Today, the PATC maintains the 100+ miles of the Appalachian Trail that run through Shenandoah National Park. The Anguish of Displacement: The Politics of Literacy in the Letters of Mountain Families in Shenandoah National Park by Katrina M. Powell. The Undying Past of Shenandoah National Park by Darwin Lambert. Shenandoah: A Story of Conservation and Betrayal by Sue Eisenfeld. Correction: Benton MacKaye, not Myron Avery, went on to co-found the Wilderness Society. Thank you for your correction! The story has been updated with the correct name. Interesting, especially the part about Lewis Mountain. I’d never heard of this Jim Crow campground.